Alaska School Psychologist of the Year Honors Two Recipients, one from KPBSD! 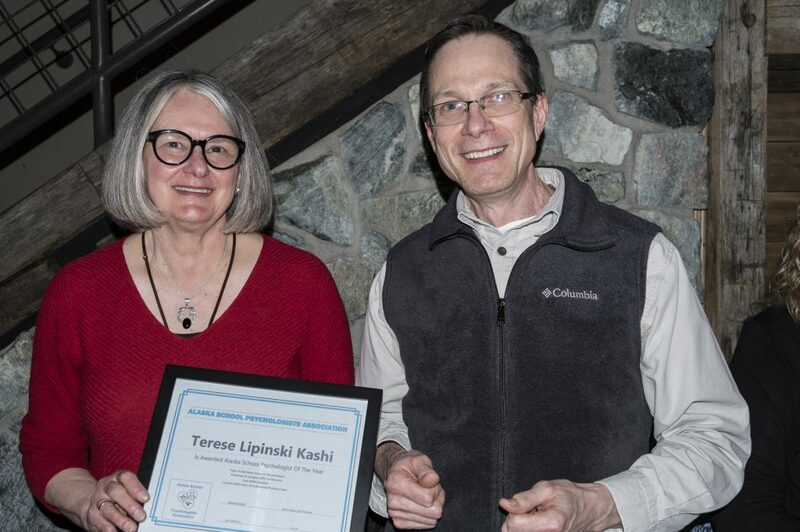 Congratulations to Terese Kashi, PhD, NCC, NCSP, school psychologist from Kenai Peninsula Borough School District! Dr. Kashi has served as a SESA board member, a member of the Alaska Governor’s Council on Disabilities and Education, and as a member of the Alaska Statewide Special Education Conference Planning Committee. Ms. Kashi has been very active with providing FASD training to different organizations and educators from around the state. Ms. Kashi is also an active participant with the Alaska School Psychologist Association, having most recently donated her time and expertise to the state association by providing an ethics training to other school psychologists. “ASPA is thrilled to announce this year’s recipients of the distinguished award of Alaska School Psychologist Of The Year. Typically ASPA only has one recipient of this award per year, but this year there are two, which were announced and celebrated at ASPA’s spring social and general membership meeting. Here’s how this process works: ASPA members are confidentially nominated at some point during the school year, supporting documentation from supervisors or colleagues is obtained, and then ASPA leadership makes the final determinations. Congratulations to Brooke Itter, MS, CAGS, NCSP, school psychologist from Anchorage School District, and Terese Kashi, PhD, NCC, NCSP, school psychologist from Kenai Peninsula Borough School District. This entry was posted on May 15, 2018 at 10:05 am. You can follow any responses to this entry through the RSS 2.0 feed. You can leave a response, or trackback from your own site.